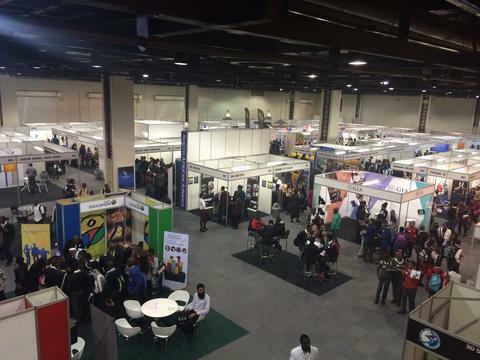 IkamvaYouth Ivory Park and Ebony Park were invited to this year’s careers indaba. 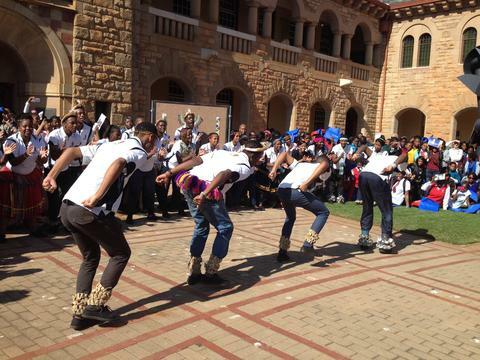 As we are an organization that has academics at heart; we accepted the invite and took along our grade 12s. We arrived at the career affair in the morning, with our volunteers and learners. We were given bags to put all our goodies in, books, pamphlets and all the essentials that one can use to enhance their career choices. After the formalities, the fun began. 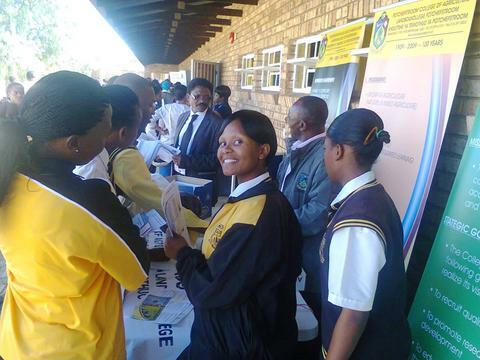 Many exhibitors from different countries, institutions and also the SABC Education were there. 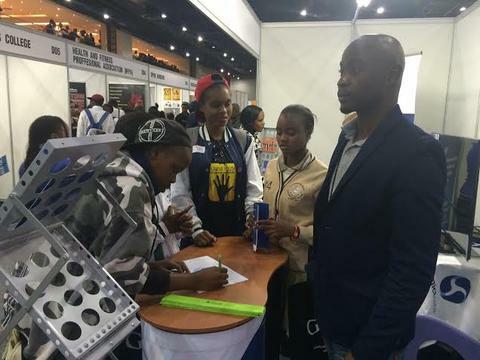 Exhibitors, like the University of Russia were there giving learners’ insight on the process of studying at their institutions and what their countries could provide for them and also the process of applying to the different institutions in Russia. The South African Defense Force was also there to answer and advices those who wanted to take a career in the defense force. Our volunteers also received an opportunity to talk to people from organizations like, Careers24,Chilli Adventures, Careers Focus and also the National Development Agency and it was clear that they were more than satisfied. Most of the international institutions such as the China Medical University, Southwest University, Education USA and Peking University of Health Science gave our learners opportunities to ask questions. Some were also displaying their power points, while others where explaining to Ikamvanites and other learners the opportunities that they countries can offer them. 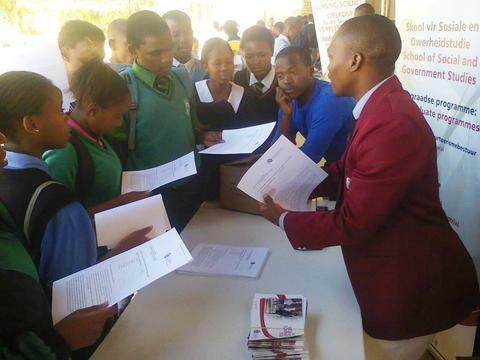 Bursary sponsors like the Anglo American, Eskom, Johannesburg Stock Market Exchange and Auditor General were also explaining to the brightest kids about their bursary selection process. It was day filled with entertainment, excitement and information, fun was had by all. 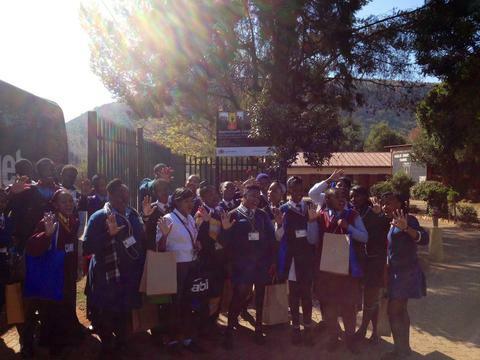 On the 24th of May, ABI in partnership with the IkamvaYouth Mamelodi Branch planned an educational trip for our grade 11 learners to the University of Pretoria’s open day. The day started with the departure time being 7am, for early arrival. Breakfast was then served to everyone on the way to the university. The rules for the day were announced and learners were put into groups of five with the ABI volunteers and IkamvaYouth staff as group leaders. The aim of the day was for the learners to gather and understand as much information as possible. This open day was a new experience for all our grade 11 learners which proved to be a very eye opening and educational for them. A variety of information was pursued with unlimited eagerness; this meant that they asked a lot of questions regarding the courses and career fields the learners had interest in. Evidently, the aim of the trip was to encourage and make the learners aware of the paramount opportunities that are available to them. 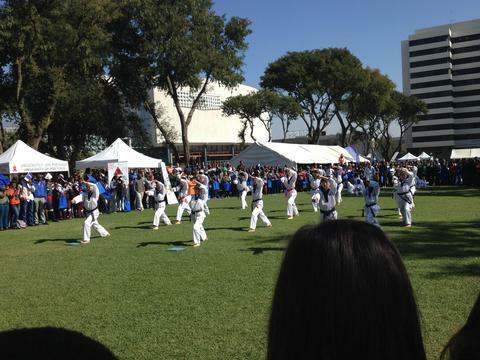 Amid the busyness of the day, learners took the time to ask and gather information displayed by the university regarding the extra mural activities that it offers to its students, this ranges from karate, choir’s, Tuks FM and the different sports offered by the university. 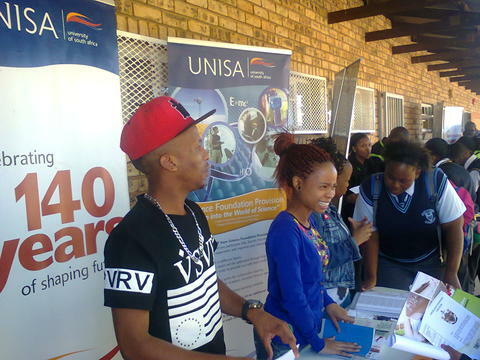 Overall the open day was well organised, well received by our learners. Every course in all faculties that the university offers was exhibited diligently. Below are two testaments from two of our grade 11 learners, Keitshepile and Thabiso, who shared their experience of the Open day. We would like to thank our branch funder ABI for organising and handling logistics for the day. A knowledgeable experience was had by all the ikamvanites that attended. 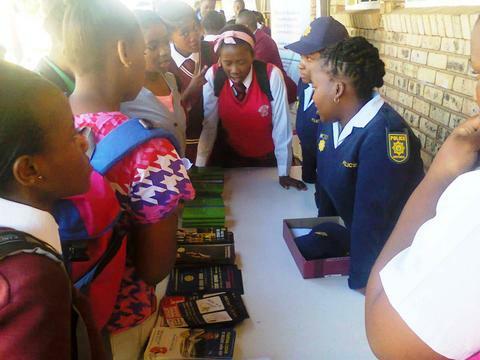 Yet another successful development opportunity stroked the Potchefstroom community when IkamvaYouth brought a Career Expo to Ikageng Township. 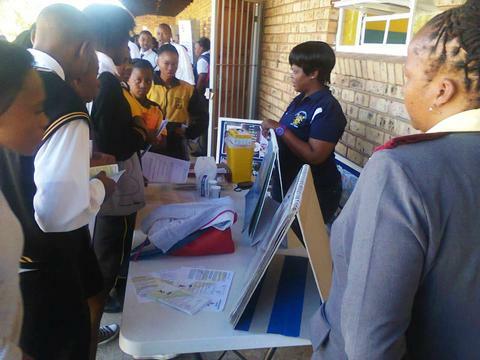 The event which took place on the 2nd of May 2014, received impressive by-in from different institutions, companies and organizations was also freely inviting to learners from all schools around the community and was hosted at Thembalidanisi Primary School, which is IkamvaYouth’s first tutoring venue in the North West Province. 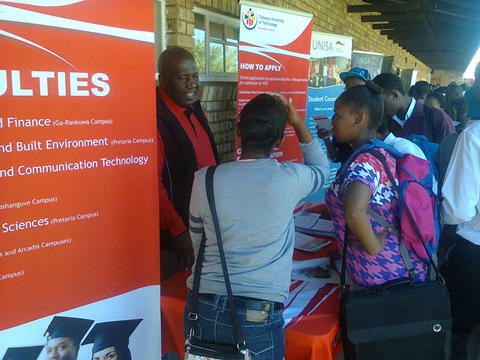 Different Career opportunities and options were presented to learners, bringing career counseling and awareness, and to most an adventure as this was the first experience and contact with many tertiary service providers in one place. 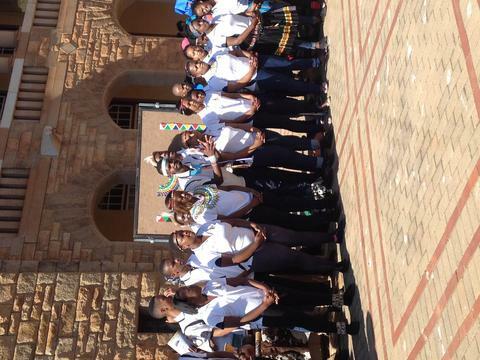 In attendance also was the Ikageng Branch team of learners, tutors and staff. High level of discipline was maintained and satisfaction met from all parties. All institutions had a chance to present their offers to learners in the IkamvaYouth tutoring hall before everyone moved out to the exhibiting stands. A Among the exibitors in attendance were institutions like TUT, UNISA, Potchefstroom Agiculture College, Excelsius Nursing College, NWU School of Nursing Science, NWU School of Social Sciences, Eskom, SAPS, WITS University, Department of Health and Rheinmetall Denel Munition (RDM). 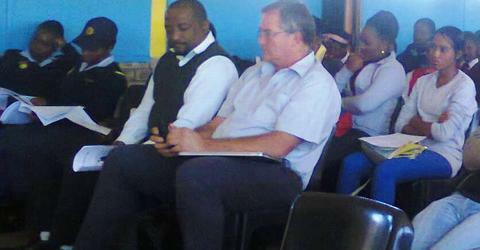 IkamvaYouth also took opportunity spreading wings, getting repute and joing up with new partners in fostering education. 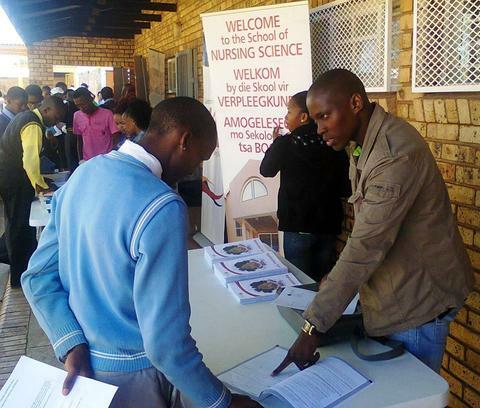 Prospective learners were also given application forms and a chance to apply being part of IkamvaYouth. Great fun and exploring dominated the event with learning taking lead, the dawn of a new era for IkamvaYouth Ikageng with the event being the first in the history of the branch. The presentations and exhibits were fairly balanced, covering a number of career options and choices. The event, in evaluation brought an exclusive drive and push for an even better Career event the next time the branch hosts another, a remarkable learning curve for all. Warm-hearted applause to all stakeholders, institutions and partners who took their precious time reaching out to the knowledge hungry community of Ikageng.